CrownBet are an Australian internet bookmaker that streams live horse racing from Melbourne and many other racecourses in the State of Victoria for free. Works on iPhone, Microsoft Lumia and Android. Watch live racing from Melbourne and every Victoria racetrack for free. A synopsis of every Australian horse race is available in the racecard. Offers a full form guide for every horse with info on breeding, racing stats etc. Watch EVERY game from the Australian Football League (AFL) for free. CrownBet is fast becoming one of Australia's top sportsbooks. Owned by Crown Resorts and regulated in South Australia, CrownBet is the official betting partner of the AFL. In addition to their superb online sports betting site, the company also operate a mobile app, which you can download onto your Apple of Android device. 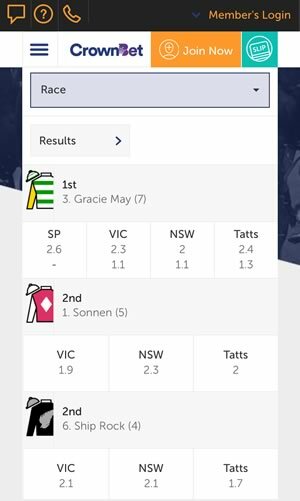 For those who enjoy horse racing, the CrownBet app offers great flexibility of being able to check prices and place bets on the ever changing markets, in addition to being able to watch live streamed racing from Victoria. 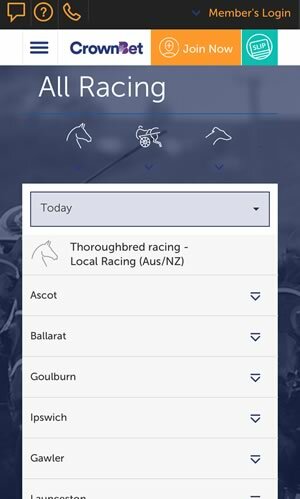 Here you can find out what the app provides racing fans, with a quick overview of Australian racing, followed by a look at the markets and features the CrownBet sportsbook app includes. Finally there is a look at the great offers you can claim once you register your CrownBet account. Australia is a premier destination for horse racing. Boasting more tracks than anywhere else in the world, Thoroughbred horse racing is the third most popular spectator sport, after Australian Rules Football and Rugby League. With highlights like the Victoria Derby, VRC Cup and the Melbourne Cup, there is much focus on racing in the southern state of Victoria. With the exception of Christmas Day you can expect to find the best flat, jumps and harness racing coming from the Australia's 'Garden State' every single day. 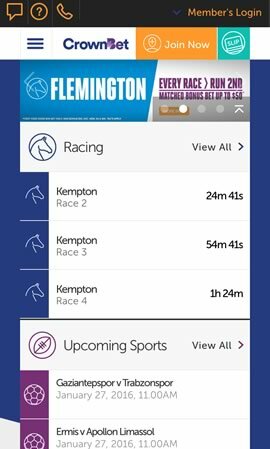 When you open up the CrownBet sports betting app, straight away you can see the next three races where betting is open. During the day these will all be horse races, although come the evening there is plenty of greyhound racing action too. You can either make your selection here, or you can access the full list of available cards by selecting 'Racing' from the top left menu button. ​At the top of this page you will see all the days meetings from various tracks in Australia and New Zealand, with a complete mix covering Morphettville, Geelong, Camperdown and, of course Flemington. Below this you can find international meetings, with races included from Hong Kong and the UK & Ireland, local harness racing and a full list of dog race meetings. Once you have selected your meeting, simply click on it and you will see all the times for the different races. If the race has already been ran, you will see the results displayed, or you can select an open one to check the card. Each horse is displayed with their owners silks, along with the trainer, jockey, and where applicable their draw. By tapping on a horse you can open up more information, including age, breeding and previous results. The page also has the option to view the full form. Along the top are the three different types of betting you can select. If you are choosing a Win/Place bet, you then have the choice of getting the prices from Best Tote, Best Tote+ or Top Fluc - the top fluctuation price based on the those set by course bookmakers, and determined by the APN. You can choose different Exotic bets too, with Quinella, Exacta, Trifecta and first 4 all available, or you can opt for a Mystery Bet, where random horses are selected for you. 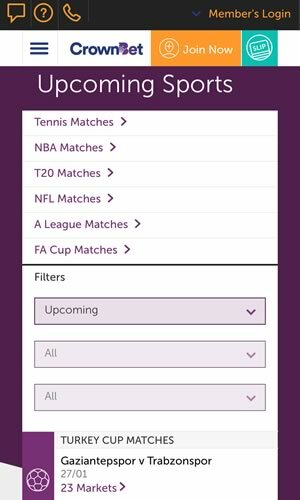 Once your selection is made, this is added to the 'betting slip' area of the CrownBet sportsbook app, where you can then select how much you want to wager and confirm your bet. After this you can explore CrownBet's other markets, including AFL, NRL, tennis, cricket, soccer and netball. By far the best feature of the CrownBet betting app is 'Live Vision', giving you the ability to watch live racing from Victoria. Even better, this service provides access to the greatest racing in the country for free! Simply log into your active CrownBet account and you will be able to watch action from Caulfield, Pakenham or Wangaratta, streamed straight to your mobile phone or tablet. These live streams start about three minutes before the advertised start times, and will end just after the interim results are announced, making sure you don't miss anything. 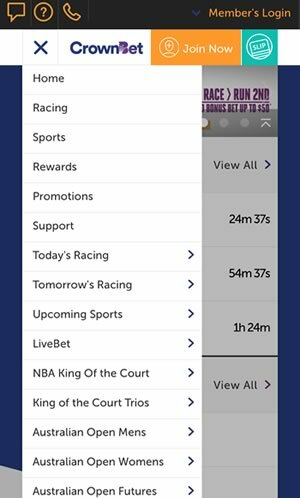 For those not using at iOS and Android app, you can access this via CrownBet's mobile website, which works on Windows and Blackberry smartphones too! Just click the Watch Live button on any Victorian race, and cheer your horse to the finish line. In addition to providing a user-friendly betting app, CrownBet offers a ripper bonus to get you started. When you make your first deposit of up to $50, you will receive 3x free bets of equal value. So basically, put $50 into your account and you get an extra $150 to enjoy or put $10 and you get an added $30 in free bets. While these bets are free, if you win off them you must bet the value of your winnings at least once before they can bet withdrawn. This can be done in a series of smaller bets, although wagers must be at odds of $1.50 or more. International customers must turnover any winnings 5x. CrownBet offers horse racing fans a complete betting experience, straight to your Apple or Android device. You can check out every race which is happening on any day, across Australia and the rest of the world. Bets can be placed directly through the app, and there is plenty of information to help you make the right choice. Then when your bet is placed, you can watch all the best racing in Victoria through your mobile phone, wherever you can get a signal.